My Konica Bizhub C360 printer says to replace drum unit (K). Does this mean we should change the black cartridge? Ideal for heavy workgroup printing, the Konica Minolta Bizhub C360 colour laser printer allows up to 100,000 impressions per month, making it the best choice for businesses that do high-volume colour printing on a daily basis. The Bizhub C-360 MFP offers multifunction features including copying, scanning, and faxing and produces as many as 36 pages per minute in colour and black and white. 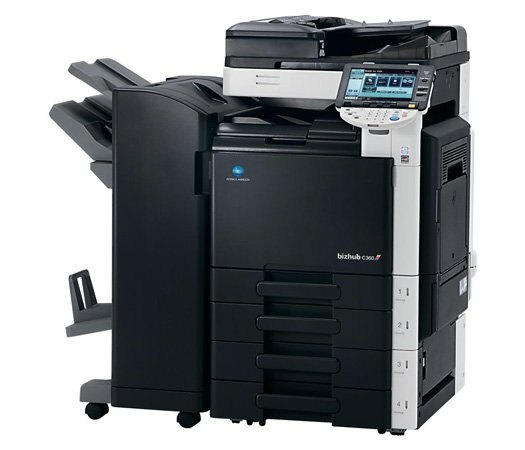 The Konica Minolta Bizhub C360 colour laser copier even offers network connectivity, but it can be expensive to buy outright. The Konica Minolta Bizhub C360 printer has a typical multifunction unit design. It has expandable paper capacity, which can be maximised up to 3,650 sheets, ideal for businesses that do heavy printing, The Konica Minolta Bizhub C360 colour multifunction printer has an automatic document feeder and versatile paper handling options, while additional paper cassettes and finisher units are optional. It connects conveniently to a network of users, and has excellent scan and fax features. Workgroups will benefit greatly from the Bizhub C360 colour printer. It has fast print rates up to 36 ppm, while print resolutions are up to 1200 dpi. It even has a built-in touch screen display for easy controls and menu navigation. The Konica Minolta C360 colour copier boasts energy saving features and high-tech security, while connective options offer versatility for different types of users, ranging from parallel to Ethernet and USB interfaces. Fax comes as an option, offering autodialing, broadcasting, and duplex transmission. Although colour lasers are often expensive to run, the Bizhub C360 doesnt fall into this category with its low-cost original Bizhub C360 cartridges that will print up to 26,000 pages per colour. However, the Konica Bizhub C360 is not the cheapest printer to own and run, especially when purchasing optional upgrades.